Call me skinny, but mang-OH so GOOD! I love mango chunks,I didn't know what I can use it for when I brought it. I just eat it straigt out of the package, it's yummy like mango ice. I also got it from Trader Joe's yesterday. Where does TJ source their mango chunks? 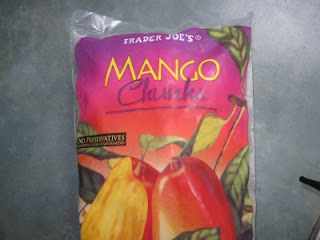 I read that Haiti's "JMB" company produces frozen mango chunks from small farmers. Have you considered supporting Haiti by buying mango from them? Thanks! These make the best smoothie! Add a splash of OJ and organic TJ's Honey Yogurt with half a banana (blend ferociously) and rock on my friends; a great way to kick start the day! I blend it with organic yogurt and agave syrup and ice and make a thick delicious lassi! yum! My cat is named Mango. He eats TJ's mango. The back of the package says 90 calories for 14 chunks, not 26. That's a little too good to be true, haha. What happened to Mango Chunks? I love your frozen Mango Chunks but I haven't been able to fine them for about a month. Are they coming back? We have been looking for them at the store, but haven't found them lately. Thought they may be out of season, but a TJ's clerk told my friend that they were discontinuing it due to low demand. PLEASE TELL ME THIS ISN'T TRUE! WE LOVE MANGO CHUNKS....USE THEM EVERYDAY IN OUR SMOOTHIES. BRING THEM BACK!!! "Baker's"... Is that a store? Hey! So excited to find organic frozen mango yesterday. Normally I bypass those tasty looking pesticide-laden bags but whoa, this time they were organic. Way to go TJ! This stuff is really great in oatmeal!! !